It seems fitting somehow that I kicked off my sabbatical year during summer 2013 by attending the SEFS conference in Germany, and then in October 2014 I traveled back to Europe for the 8th International Shallow Lakes Conference held in Antalya, Turkey (http://shallowlakes2014.org/). It feels as if the professional part of my year abroad is complete, having closed the loop. Last year, I presented at SEFS in July, gave invited talks in Scotland in Oct, at Trinity in Nov, and talks in two different departments at Queen's in Feb and March. All of these international presentations gave me lots of experience giving longer seminars to broad audiences, as well as helped to build my professional network. As a result, I was invited to give a landscape limnology plenary/keynote address at the 8th International Shallow Lakes Conference in Turkey. What an honor! I also agreed to give a lunchtime workshop about how to make and maintain high-performing research teams while at the conference. I awoke Monday morning to see the Turkish landscape for the 1st time. The conference was in a fancy 5 star resort hotel on the Mediterranean (http://www.akkaantedon.com/). From my balcony, I saw steep mountains in one direction and the Sea in the other. This conference was extremely international. There were ~300 in attendance and I met people from Brazil, Mexico, Ethiopia, Australia, Canada (I was one of a handful of people from the U.S.), China, Singapore, Japan, and ALL OVER Europe. The conference was also very social, allowing me to meet a lot of great scientists - they had an opening banquet Sun night, a Latin dance Mon night, a beach party Tues night, and a gala dinner and dance Thurs night. These shallow lake ecologists definitely know how to have fun (and dance) after a long day of science! My plenary and workshop both went well, with ~200 and 35 people attending each, respectively. People asked me a lot of questions after each, and I had many conversations afterwards about the topics I presented. 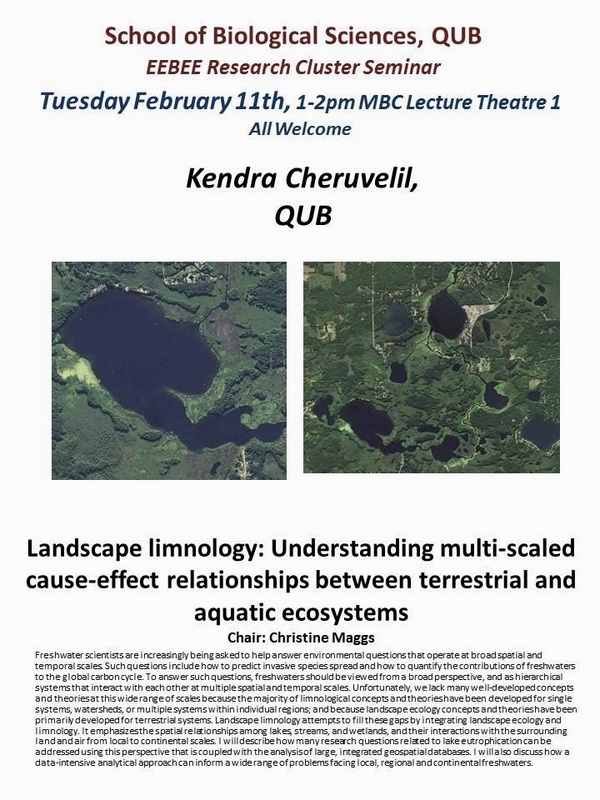 Because some of the scientists at this conference do not work at very broad scales (e.g., they tend to work on one to a handful of lakes at a time), my landscape limnology talk presented them with some different ideas to think about. Overall, being at the conference was intellectually stimulating - I even got a new idea for a research project that I will propose to my CSI Limnology group related to shallow lakes! One day, the whole conference took off on excursions to see the area. I went on one that went to Phaselis, Mount Chimaera, and Omlypos. The countryside is just beautiful. So many olive, citrus, and pomegranate trees… and very dramatic vistas of mountains and beaches. We were lucky weather-wise, it poured rain while we were on the bus between two different stops, but cleared up for our hikes. Phaselis was mainly strolling thru old ruins (the theatre was especially neat) - https://en.wikipedia.org/wiki/Phaselis. Mount Chimaera was a really nice hike up to an area with methane emissions that are on fire (lots of mythology there!) and back - https://en.wikipedia.org/wiki/Mount_Chimaera. Olympos was this really expansive ancient city - the ruins were in amongst the forest and along a river all the way out to the Sea and even along the beach and on cliffs (https://en.wikipedia.org/wiki/Olympos_(Lycia)). We only saw a small part of it, and it was amazing. We also had an hour on the beach at Olympos. Here are two articles about this beach and area from the Guardian: http://www.theguardian.com/travel/2012/aug/22/turkey-guesthouse-budget-beach and the Telegraph: http://www.telegraph.co.uk/travel/bestbeaches/7634792/Best-beaches-in-Turkey-Olympos-Antalya.html. What a great ending to an amazing year of sabbatical. I feel very fortunate to have had such an enriching professional experience. In May, I got word that my lab will grow by two during the 2014-2015 year. I'm very happy to announce that I'll have two new postdoctoral research scientists join my lab next year. 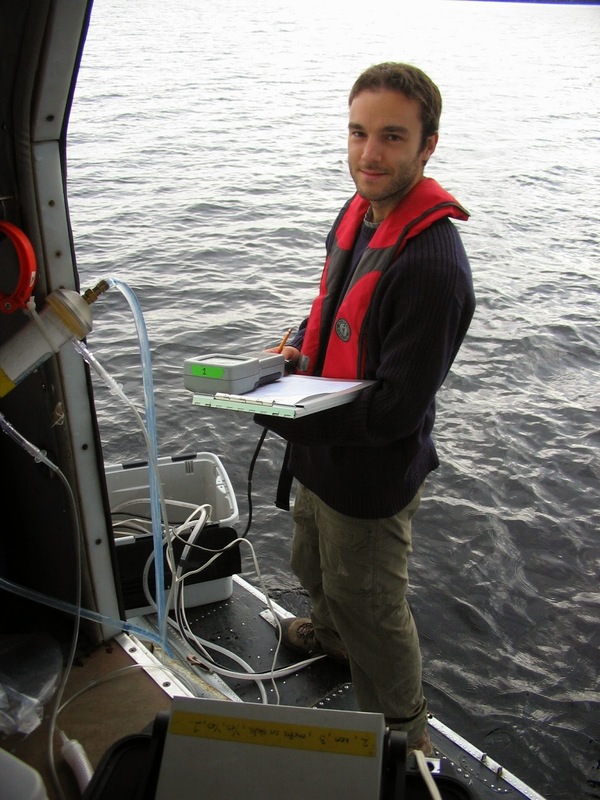 Dr. Jean-Francois Lapierre (above) has received a FQRNT Fellowship from the Quebec Government (http://www.frqnt.gouv.qc.ca/en/bourses/index.htm) to partially support his 2-year postdoc in my lab. He comes from the University of Quebec, Montreal where he recently finished his PhD working with Dr. Paul del Giorgio (http://www.carbbas.uqam.ca/en/group/present-members/41-jean-francois-lapierre.html). He will join the CSI-Limnology team (www.csilimnology.org) researching large-scale patterns and processes governing lakes. I'm looking forward to working with him starting in September. Dr. Caroline Wynne (above) has received an Irish EPA Fulbight Fellowship to join my lab for six months (http://www.fulbright.ie/record-breaking-40-irish-recipients-awarded-prestigious-fulbright-award). She comes from Dublin, Ireland where she has been a postdoctoral researcher with Dr. Ian Donohue at Trinity College, Dublin (https://www.tcd.ie/Zoology/research/research/donohue/researchers_carolinewynne.php). I first met her last summer in Germany at the Symposium for European Freshwater Sciences, and then interacted with her some this year while at QUB. She will join the Lakes as Social-Ecological Systems (http://www.fw.msu.edu/~llrg/social-ecological-systems.php) team researching the interactions between human land use decision-making, lake water quality, and the ecosystem services that lakes provide humans. As a Fulbright Fellow, she will be expected to serve as an ambassador for Ireland. In addition, since her Fellowship is funded by the Ireland EPA, she will want to network with analogous agencies in the U.S. (e.g., MI-DEQ and DNR, US EPA). I'm looking forward to working with her starting in January. Welcome JF and Caroline, and congratulations on your respective awards! I am a long-time member of ASLO, and would normally have gone to this conference and presented at it. However, the thought of traveling ~12 hours and having a 8 hr time difference just two months before we move back to MI did not appeal. So, I sat this one out. But, my friends and colleagues rocked it! CSI's lead-PI, Pat Soranno, gave a keynote address on Thursday titled Landscape limnology: Understanding freshwaters at regional to continental scales (http://sgmeet.com/jasm2014/keynote.asp). She spoke about the challenges and opportunities associated with data-intensive ecological research, and her talk inspired lots of questions, comments, and discussion. In addition, we have been using social media to help disseminate our research results (including this blog), and Pat's keynote hit Twitter - she got lots of tweets about the term "data-intensive research" being better than "big data" when describing ecological research like ours, about effective teams including diverse members with interpersonal skills, and about her argument for data sharing to promote a fully democratic environmental science. Nice! TAXONOMY OF CHANGE: USING CLUSTER ANALYSIS TO IDENTIFY TEMPORAL- PATTERNS IN LIMNOLOGICAL DATA by Noah Lottig and Pang-Ning Tan et al. PREDICTION AND PATTERNS OF LAKE DEPTH ACROSS A 17-STATE REGION IN THE U.S. by Samantha Oliver et al. LESSONS FROM LAGOS: THE TRIUMPHS AND CHALLENGES OF CREATING AN INTEGRATED MULTI-SCALED, MULTI-THEMED LAKE NUTRIENT GEODATABASE AT SUBCONTINENTAL SCALES by Sam Christel and Pat Soranno et al. MEASURING PATTERNS OF LAKE, STREAM, AND WETLAND CONNECTIVITY AT MACROSCALES by Emi Fergus et al. WHICH GLOBAL AND REGIONAL CLIMATE METRICS AT MACROSCALES BEST DESCRIBE LAKE WATER QUALITY RESPONSES TO CLIMATE CHANGE? by Caren Scott et al. SUBSIDY-STRESS EFFECTS OF NITROGEN ON PHYTOPLANKTON BIOMASS by Chris Filstrup et al. From all accounts, and despite Portland issuing a boil water alert during the conference, the JASM was a great success. I wish that I could have been there to share my current research and see all of my friends and colleagues! I'm a co-author on a cool new CSI limnology (http://www.csilimnology.org/) paper published during April in the online, open access journal PLoS One. This research examines long-term water clarity trends in Midwestern US lakes. There are not enough researchers or government agency staff to collect data on lakes every week, let alone every month, or even every year! But, citizens living on lakes can collect these data, and many do. In fact, my own parents and grandfather collected water clarity data for years on Quacumquasit Lake in MA and Elk Lake in MI! All of this research is thanks in part to the dedicated citizens who have spent years sampling their lakes, agency personnel who help train them and sometimes maintain the databases, and also to Father Pietro Angelo Secchi, a papal astronomer, who invented the Secchi disk well over a century ago. The picture to the right shows a monument to him in the Villa Borghese Park in Rome that some CSI members STUMBLED upon while strolling in Rome one day about a decade ago. The black and white pattern on the statue attracted the attention of the limnologists, and they paid homage to this important limnological historical figure. Meanwhile, observers walking by the photographer (our very own Katherine Webster) were heard saying, “tourists will take pictures of ANYTHING in Rome”. Ha! CSI Limnology continues to build our large, geospatial database, LAGOS, by integrating limnological data such as these citizen datasets with data from: state and federal government agencies, tribal agencies, and university researchers, with large numbers of geographic data sources to address further basic and applied science questions across broad spatial and temporal scales. More to come! A big thanks to Ed Bissell for database support and guidance for this effort and Pat Soranno for her contributions to this post. I'll have just returned to the US, but I highly recommend you attend August 18-22, 2014! I was invited to give a talk to the School of Biological Sciences (http://www.qub.ac.uk/schools/SchoolofBiologicalSciences/) at Queen's this week. My seminar was part of the Ecology, Evolution, Behaviour and Environmental Economics Seminar Series (http://www.qub.ac.uk/schools/SchoolofBiologicalSciences/OurResearch/EcologyEvolutionBehaviourandEnvironmentalEconomics/), which is attended by mainly students and some faculty. During the past 6 months, I have gone to a few of the other seminars in this series (e.g., Drs. Catherine McGavigan and Dmitry Kishkiniev speaking about aquatic plants and migrating birds, respectively) and it seems like a dynamic group. My talk, titled "Landscape Limnology: Understanding multi-scaled cause-effect relationships between terrestrial and aquatic ecosystems" was in the Medical Biology Center, about a block from the building my office is in. My talk was a bit sparsely attended, but well-received. I had some interesting questions after the talk and look forward to continued interactions with EEBEE at QUB. It is interesting to experience the differences in culture across Universities and Schools. For example, there is no preceding or following social for this seminar series. Instead, the group gathers every Thursday morning for coffee and cake. I plan to attend one of the coffee hours soon to engage further with people from this cluster. Special thanks to Dr. Christine Maggs, Head of School, for hosting me. Science teams make the news! Creating and maintaining high-performing collaborative research teams: the importance of diversity and interpersonal skills by Kendra S Cheruvelil, Patricia A Soranno, Kathleen C Weathers, Paul C Hanson, Simon J Goring, Christopher T Filstrup, Emily K Read (http://www.esajournals.org/doi/pdf/10.1890/130001). Check out MSU's press release about my paper here: http://msutoday.msu.edu/news/2014/research-its-more-than-just-the-science/, which has also been picked up by Science Daily: http://www.sciencedaily.com/releases/2014/02/140204123732.htm and Phys.org: http://phys.org/news/2014-02-science.html. First, over a decade ago, I began working with three amazing ecologists: Drs. Patricia Soranno, Mary Tate Bremigan, and Katherine Webster. We got a grant from the US EPA to fund some of our Landscape Limnology research (www.fw.msu.edu/~llrg) and were able to do a LOT of great science with a relatively small number of tax-payer dollars. We have since expanded our research team in multiple directions (e.g., CSI Limnology and Lakes as Socio-Ecological Systems), and have continued to work really well together. I don't take these great research teams for granted because to work productively together is not a given in science. In fact, high-performing science teams take a lot of work to create and maintain! But, I am committed to these teams that keep me passionate about science. Second, I began teaching introductory organismal biology in MSU's Lyman Briggs College (www.lbc.msu.edu). Right away, I noticed that my students struggled to work effectively in their lab teams and that those struggles negatively affected their science learning and their attitudes about biology. I began attending teaching seminars and reading the education literature about how to facilitate effective student teams. In fact, when I was an MSU Lilly Teaching Fellow (http://www.fod.msu.edu/opportunities/lilly-teaching-fellows-program), I designed a Scholarship of Teaching and Learning project that asked: How do diverse base groups impact student learning and attitudes in introductory biology? Over the past eight years, I have learned a lot about how to help students working in teams do so in better, more satisfying, and more scientifically productive ways. Third, I began working with some of my LBC colleagues to increase awareness and appreciation of diversity in its many forms. With Drs. Georgina Montgomery, Cheryl Murphy, and Cori Fata-Hartley, I formed a new standing committee, LBC Inc, which has the goal of promoting and fostering an inclusive environment and equal opportunities for all LBC students, faculty, and staff through education, research, and service (http://lymanbriggs.msu.edu/faculty/standing.cfm); with Drs. Georgina Montgomery, Cori Fata-Hartley, and Aaron McCright, I developed a senior capstone course that used service learning and student research to explore issues of diversity in science; and with Dr. Cori Fata-Hartley, I developed and implemented a seminars and workshops about the importance of diversity for science teaching and learning (e.g., Creating an Inclusive Classroom). I found all of these experiences extremely rewarding, and at the same time was continuously reminded of how challenging it is to think and talk about "diversity", no matter the context. So, how did these three different aspects of my job come together to create this Frontiers in Ecology and the Environment paper about science teams? Over the course of the last 10+ years, I have been experiencing and observing a huge number of teams at work - in the classroom, in my lab, and beyond. The teamwork skills I learned in order to help my students and the literature I read about the importance of diversity for teaching and learning began informing my research teams. I began to lead my research teams through teamwork exercises about negotiating conflict and time management. I designed an online survey for CSI Limnology to assess team functioning. I started raising other scientists' awareness about the importance of diversity and interpersonal skills for science teams. And then, word got out -- I began getting emails from colleagues around the world asking me for my teamwork materials so that their research teams could increase their level of productivity as well. Thus, this paper was born! I wrote this paper with some amazing co-authors: Patricia Soranno, Kathleen Weathers, Paul Hanson, Simon Goring, Chris Filstrup, and Emily Read. We wrote the paper to provide scientists with a strong rationale for why they need to very carefully create diverse research teams, teach scientists teamwork and leadership skills, and value such training and its outputs. In addition, our paper provides many concrete examples of how to create and maintain high-performing collaborative research teams (check out the online supplemental documents: http://www.esajournals.org/doi/suppl/10.1890/130001/suppl_file/i1540-9295-12-1-31.s01.pdf). We wrote the paper based on our own experiences working in teams (not all of which have been high-performing) as well as using research published mainly in the fields of education and business. Finally, our paper was informed by the really cool new discipline called the science of team science (http://sites.nationalacademies.org/DBASSE/BBCSS/CurrentProjects/DBASSE_080231). We hope that our paper is helpful for science teams that want to improve, scientists in training who want to learn teamwork and leadership skills, and administrators who are thinking about how to evaluate and reward scientists who work in teams. The end result of high-performing science teams is better science being conducted, which is a win for everyone! This special issue (http://www.esajournals.org/toc/fron/12/1) was partly the result of a two-day meeting held during February of 2012 in Boulder, CO. Researchers funded through the NSF-MacroSysytems Biology Program (http://www.nsf.gov/funding/pgm_summ.jsp?pims_id=503425), including me, got together to share ideas and tools and talked a lot about what it is that makes macrosystems ecology tick, including effective interdisciplinary teams. You can check out the NSF's press releases here: http://www.nsf.gov/news/news_summ.jsp?cntn_id=130218&org=NSF&from=news and http://www.nsf.gov/news/news_images.jsp?cntn_id=130218&org=NSF. A special shout out to my long-time LLRG, my LBC students and teaching assistants, and to Cori Fata-Hartley!